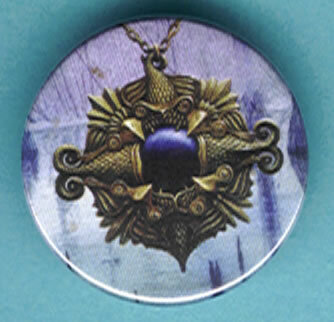 This is an officially licenced pin of Ebony Charm which is also on the Mirage booster box. The plastic coated paper on metal pin is almost 1.50 inches round. It has the saftey pin type catch on the back. While this item is used, you will have a hard time telling it. We also have the pin with Ivory Charm from the Mirage starter box.